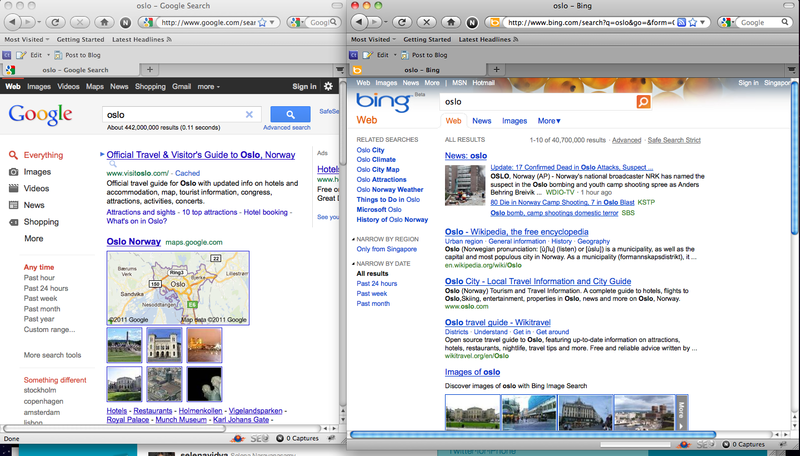 I feel disappointed to Google search today when I try to find out the news about the Norway shooting. I went to query "Oslo" on Google, all above the fold of results are nothing about news and then I go to check at Bing, it gives me better result, it shows "breaking news" on the first position of SERPs. You can see the screenshot as attached here. Norway attack news is breaking to all major news publication : CNN, BBC, WSJ, etc. This should trigger to Google result. I am quite surprise on this result, Google always does a good job on return the result based on user intent. Something leak on user intent algorithms? Let's discuss why it was happen. 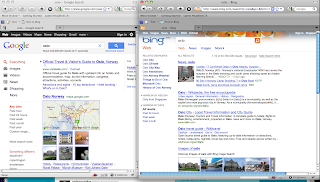 In more ways than one, I presume it as a tie between Google and Bing on real time search. Bing leverages the power of twitter while Google has real time widgets from CNN and sports sites to display active results on SERPS.